The region incorporating the Western Isles, Skye and the Small Isles contains some of the oldest and youngest rocks in Scotland; from ancient Lewisian gneisses to 60 million year old volcanic rocks. 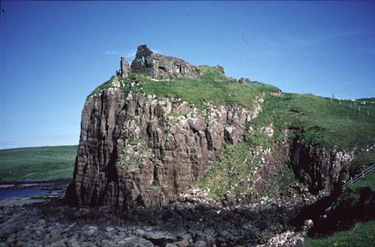 Duntulm Castle – a layered intrusion of Palaeogene age on the Isle of Skye. © Colin MacFadyen/Scottish Natural Heritage. Most of the Outer Hebrides is comprised of Lewisian gneiss, the name being derived from the isle of Lewis. The Lewisian gneisses represent the oldest rocks in Britain and date back to around 3000 million years ago. These rocks, which were mostly granite-like in origin, have experienced numerous upheavals in the Earth’s crust or ‘mountain building events’. These processes deformed and metamorphosed the rocks. Lewisian gneiss also occurs on Raasay, Skye, Rum, Coll, Tiree and Iona. The ancient Lewisian Gneiss also encompasses rocks such as quartzites, marbles, graphitic schists and amphibolites, which are thought to be originally sedimentary and volcanic rocks. On Skye, Rum and Raasay there are layers of red Torridonian sandstones, which were laid down in ancient river systems some 1000 million years ago. Also on Skye, there are a variety of rocks deposited in a shallow sea between around 550 and 450 million years ago, during the Cambrian and Ordovician periods. These include pure white beach sands in which sand worms burrowed, as well as marine limestones. Around Stornoway and on Raasay, Skye Eigg and Rum, sedimentary rocks occur that are representative of all three geological periods in the Mesozoic Era: the Triassic, Jurassic and Cretaceous. Deposited either by rivers or in shallow marine conditions, these rocks tell us much about western Scotland between 245 and 90 million years ago. The remains of volcanic complexes on Rum and Skye, which include lavas, and igneous intrusions, date from an intense period of volcanic activity along the western margin of Scotland. This represents the time when north-west Europe began to split from North America, with the formation of the North Atlantic. The region is particularly noted for its heavily ice-scoured landscapes and exceptionally well-developed machair, sand dunes, sandy beaches and inter-tidal sandflats. The Outer Hebrides and outlying islands, particularly St Kilda, are of great importance for understanding the glacial history of the north-west seaboard of Britain. Much of Lewis, Harris, the Uists, Benbecula and Barra are rocky and heavily ice scoured. The mountains of Harris display good examples of mountain glacier landforms and deposits. Glacial deposits are generally thin and localised, but thicker deposits along parts of the coast of Lewis allow an understanding of the recent geological history of the NW margins of Britain. Crucially, several features pre-date the last glaciation. It is thought that parts of St Kilda may have remained ice-free during the last glaciation, probably the only such land area in Scotland to be so, apart from some mountain tops. On Skye, the Cuillin represent the most ‘alpine’ type of scenery in Britain, formed during repeated episodes of glacier erosion. 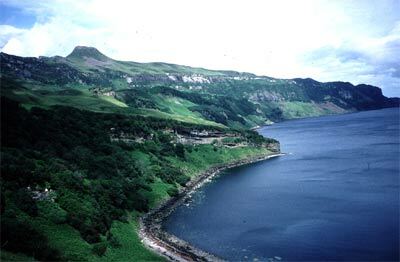 Where the Palaeogene age lavas are underlain by weaker sediments on the scarp landscapes of Skye and Eigg, there are spectacular large-scale landslides, which are unique in Britain. Where the ice-scoured coastline of the Outer Hebrides has been drowned by the sea, the result is an archipelago of islands, skerries and reefs. The extensive machair, sand dunes, sandy beaches and inter-tidal sandflats, are a particularly outstanding feature of the coastal geomorphology of the area. In stark contrast, the coastline of St Kilda is dominated by cliffs, including the highest in Great Britain. Many of the lochs and peat bogs of the area contain valuable archives of past environmental changes and vegetation history. Hallaig on the Isle of Raasay – a thick sequence of Lower and Middle Jurassic sedimentary rocks, that were laid down over a 25 million year period, around 160 million years ago. © Scottish Natural Heritage.